Today I thought I'd take a little break from all the festive posts and do a tag! This isn't a typical type of tag I'd go for but as I was supposed to have gone on holiday last month but didn't due to moving house I currently have a slight case of wanderlust! I'm not that much of a traveller but I hope you enjoy the post all the same! I actually can't remember exactly but I'm sure it was somewhere Spanish-y when I was a child. Probably to Menorca or somewhere similar. I actually haven't travelled to many places really! *wonders why she's doing the tag* But I love the Canary Islands which offers sun, sea and sand and isn't a long flight (it took me a while to get over anxiety when flying). Somewhere I actually do go back to and will continue to do so for a long time to come I imagine. I think I'd have to cast my anxieties about long-haul flights aside or drug myself up and go to San Francisco or Dubai. San Francisco because it has both the city and nature and I'd need that balance and Dubai for the food buffets (oh dear... am I really admitting that), shopping and beaches. Again I need that balance of calm. So I'm taking this as my preferred method to travel long distance. I'd have to say by plane as the idea of travelling in a car for hours seems like hell. But the idea of travelling by train in Europe doesn't seem too bad... less hassle than flying and possible good views! 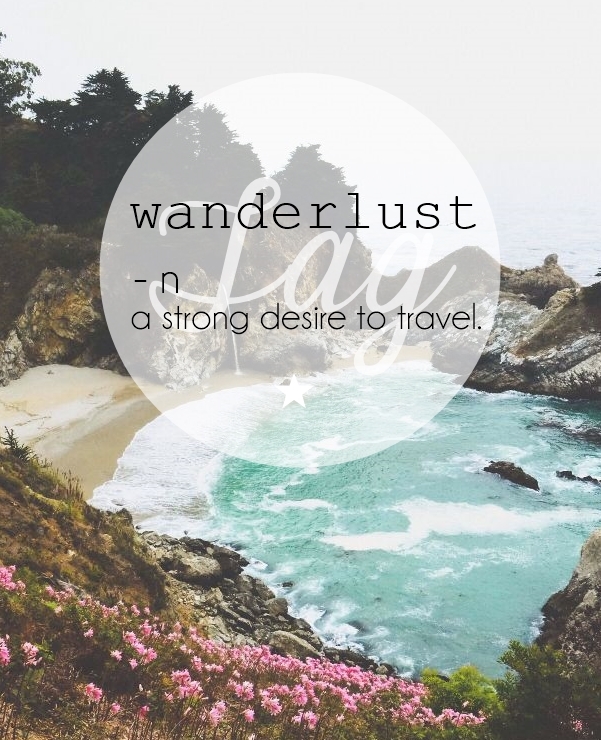 My favourites travel blog has to be World of Wanderlust. It's such a great mix of travel articles, tips and lifestyle posts. It's made to want to visit more places in Europe and often gives me wanderlust. Also it has such beautifull photography! Well I mentioned about wanting to go to Dubai for the buffets... but that wouldn't be my only reason for going. So it would have to be New York! I'm sure I'd come back feeling very unhealthy but I'd love to experience stacks of pancakes for breakfast, on the street pizza and amazing bagels. Mmmm yes. Probably Morocco... I found it quite grim if I'm honest. Granted I went to Tangier and not the capital but I wasn't prepared for the poverty or maimed child beggars at all. It was probably a very true look of the city but not somewhere I'd ever choose to visit again. Is this a thing? As you can guess my answer is no to this. Other than booking a holiday I haven't ever needed to recite my passport number... so I haven't remembered it. More and more I'm wondering why I'm doing this tag seeing as I don't travel too often! Without a doubt a window seat. Yes, you are squished in next to two other people, who have to get up if you want to go to the toilet.... but at least you get to see out! This for me makes the plane feel a lot less compact and claustrophobic, plus you do get some amazing views of the clouds and different parts of land. Films, films and more films. Then when I've ran out of them or battery I resort to reading and eating. The last time I flew back in May was the first time I flew without any anxiety which meant I actually ate! I gave hot food a miss as it didn't seem all that appetising but I was all over the snack selection box! So it's safe to say I'm not much of a traveller and I don't often get wanderlust but hopefully you found my answers somewhat interesting! PS. Feel free to do this tag on your own blog if you have one!